As has been reported numerous times here at Health Impact News for the past 6 years or so, the pharmaceutical industry has been desperate to find an Alzheimer’s drug to market to an aging baby boomer population with ever increasing numbers of Alzheimer’s Disease cases. And yet, billions of dollars have been invested in potential drugs only to see these drugs never make it out of the trial phase and come to market, because they do not significantly help Alzheimer’s patients. Biogen and their partner Eisai are the latest pharmaceutical companies to throw in the towel regarding their Alzheimer’s drug aducanumab, which has failed to make it out of phase 3 trials. Many drug researchers have now abandoned the theory of amyloid plaque accumulation in the brain as the causative factor of Alzheimer’s. Could aducanumab’s failure be the last nail in the coffin for this theory, as natural approaches to Alzheimer’s such as coconut oil and the ketogenic diet see more positive results? An independent risk assessment during Biogen’s early phase 3 trials signaled the end of their efforts to develop a “blockbuster drug” based on aducanumab for Alzheimer’s. Aducanumab is a solution of synthetically-derived antibodies based on human cells that have been specifically arranged to attack amyloid beta (AB) antigens. Amyloid beta plaques are considered the stuff of Alzheimer’s disease. Bioengineering antibodies is one aspect of immunotherapy. Phase 3 trials are near the end of clinical trials involving humans with the largest numbers, 300 to 3,000 humans with the disease the drug is intended for. Before clinical trials begin, there must be satisfactory in vitro and in vivo (lab animal) results that suggest possible medical merits. The independent risk assessment that predicted there would be no successful efficacious outcome on any significant level was convincing enough to drop the risk of losing more money and failing their stockholders. The expected outcome was increased memory and mental acuity of most patients with minimal severe side effects for their phase 3 participants with early-stage Alzheimer’s disease. If there were no adverse events or safety issues among the participants, as Biogen officially stated, then they were not getting enough restored memories, cognitive improvement, and improved dispositions to continue throwing money at the project. If the earlier in vitro tests (lab culture experiments) had shown strong evidence of getting rid of amyloid beta plaque, why wasn’t it working to at least marginally improve enough human trial participants to continue the phase 3 trials? I think this solidifies the opinion that amyloid-targeted therapies do not have a clinical effect at the symptomatic stages of the disease process. These three medical academics seem to be saying it’s possible all the pharmaceutical whizzes so far have been targeting the end result of Alzheimer’s disease instead of the potential source. Maybe that’s why, prior to Biogen-Eisai’s failure, Eli Lilly’s AD (Alzheimer’s disease) drug failed during phase 3 trials. Other failures with developing a marketable AD drug include Johnson & Johnson, Pfizer, and Roche. 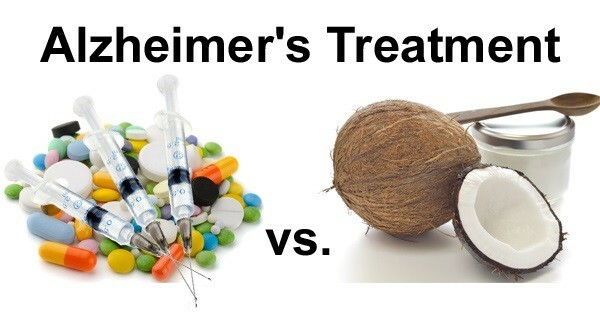 An easier, less expensive, and more accessible alternative natural option for Alzheimer’s and other associated neurological disorders would be coconut oil. Health experts and medical practitioners not under Big Pharma’s thumb have realized that Alzheimer’s disease and other neurological disorders are symptoms of type 2 diabetes of the brain. Insulin resistance inhibits glucose from entering into cells for energy. It is the hallmark of diabetes 2. Because of cellular insulin resistance, glucose is not making it into brain cells to energize them. Insulin is needed to carry glucose into cells for the energy required for proper metabolism. Some are calling this insulin resistance in the brain diabetes type 3. But medium chain fatty acids or triglycerides (MCTs) provide ketones that are energy sources not dependent on insulin to carry them into brain cells. MCTs are not stored as fatty tissue triglycerides for future energy use. The liver processes MCTs to produce ketones that are available for immediate energy use in brain cells without the need for insulin. That’s why so many have turned to virgin coconut oil to reduce and even reverse symptoms of Alzheimer’s, Parkinson’s disease, and other neurological disorders. Not only are the results without adverse side effects, coconut oil offers other health benefits. Depending on the severity of one’s neurological disorder, two to four tablespoons daily is usually sufficient for improving Alzheimer’s and Parkinson’s conditions as well as performing as a natural antibiotic, anti-fungal, and antiviral agent. Using cannabis for Alzheimer’s or Parkinson’s disease and other related brain and nervous system disorders usually requires full spectrum cannabis with THC. It has even been laboratory tested for what it can do for Alzheimer’s disease by the Salk Institute and the University of California, both in La Jolla, California. This means that using cannabis with THC for any reason prevents amyloid beta formations and brain cell inflammation significantly, greatly reducing the risk of Alzheimer’s or other neurodegenerative diseases by eliminating the root cause before any symptoms arise, or stated simply, nipping it in the bud. Cannabis has opened up dramatically for medical use in over half of America’s states. But not all states have medical cannabis arrangements, and some of those that do may not allow full spectrum cannabis with THC for Alzheimer’s or Parkinson’s disease. A cannabis doctor or cannabis dispensary consultant can be helpful with advising what condition other than Alzheimer’s or Parkinson’s disease a patient can use that’s allowable under his or her state’s guidelines. This cannabis medical allowances state by state guide might be helpful.